Because the kids can't get enough miniature plastic replicas of replica rock stars from a replica rock n' roll game. 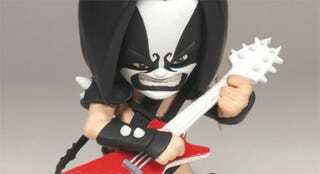 Due in stores next February, McFarlane's line of "Guitar Hero Rockers" are 2-inch, stylised versions of the game's main characters, and will be bundled in pairs. If your quarterly quota of McFarlane/Guitar Hero plastic merchandise hasn't been filled by February, they should cost you around $7.